The fourth Super One round of the season on May 13-14 saw some drivers consolidate their championship positions and new contenders come to the fore. The weather was overcast on Saturday with some rain showers on Sunday morning. 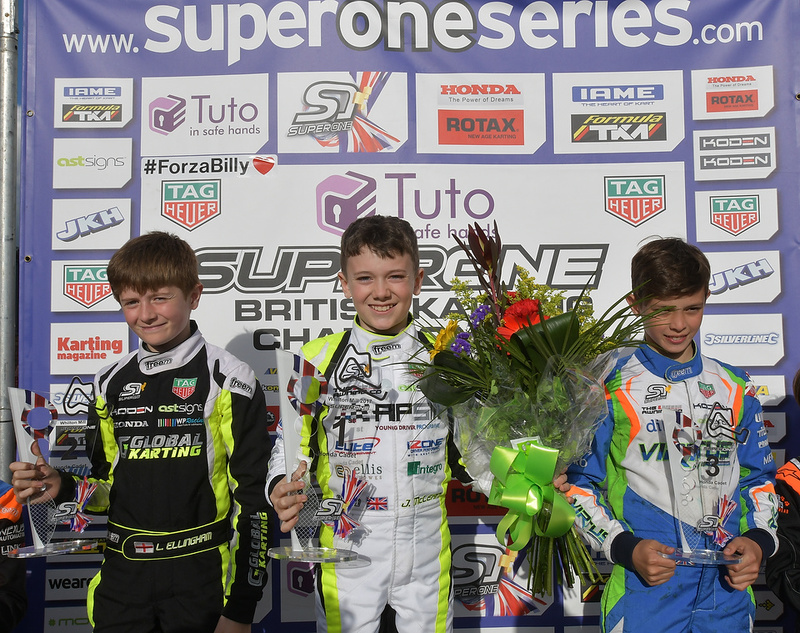 The inspirational Billy Monger visited the Super One paddock, to the delight of everyone who knows him or who has been affected by his recent accident. 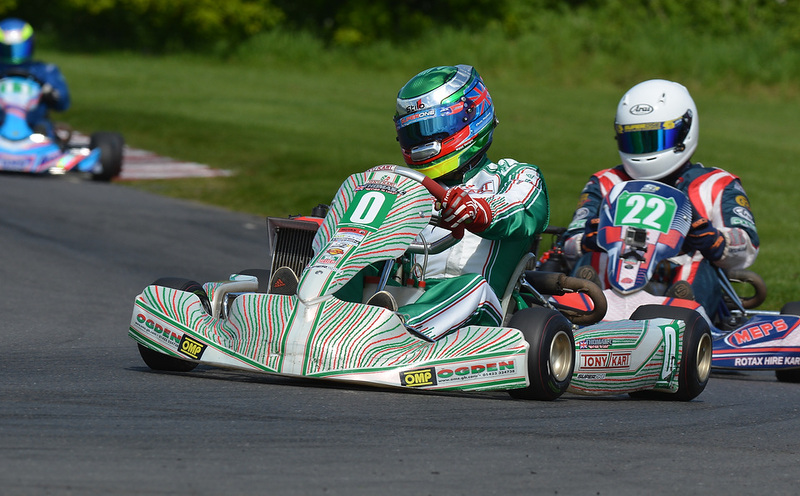 Poleman Joshua McLean took the first heat win, then Archie Brown took the other two wins from 9th on the grid. Final 1 was on a dry track and Brown led at the start before he was briefly overcome by Harvey Charter. McLean picked off Lucas Ellingham then Charter to lead most of the race but on the last lap, Ellingham, who had stayed on McLean’s bumper throughout, saw his chance to take the win. McLean finished 2nd and Oliver Bearman 3rd. Final 2 was abruptly truncated just after half distance after a crash between Ivan Lomliev and Sebastian Bloch caused a red flag, for which Lomliev was disqualified. McLean led all seven laps and finished just ahead of Ellingham with Bearman 3rd again. In the Championship standings Brown is now 34 points ahead of McLean. The next round for the Honda Cadets is on 4th June at Clay Pigeon in Dorset. Taylor Barnard and his team-mate Alex Dunne were neck and next in the heats ahead of poleman Matthew Rees. Final 1 took place with everyone on slicks on a drying track and Barnard pulled further and further away for yet another win, with Rashan Chigorimbo able to come through to 2nd and close the gap slightly to Barnard on the last lap. However, he was disqualified after coming in underweight. 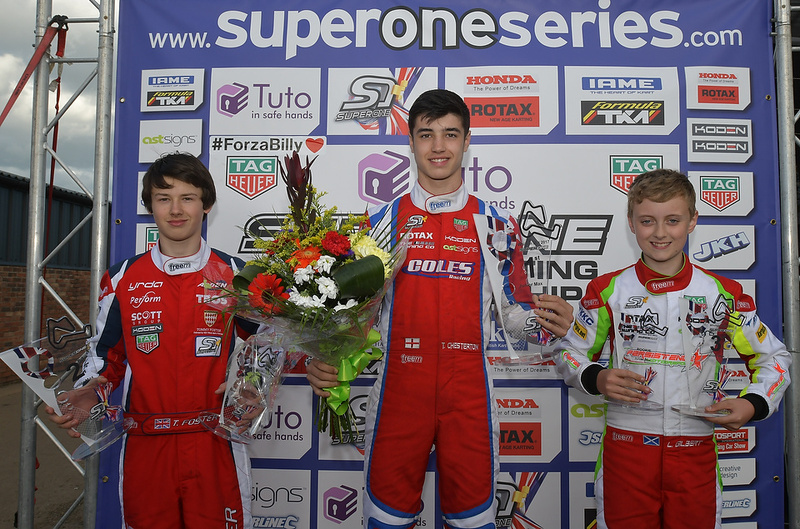 Maxwell Dodds and William MacIntyre fought hard for 2nd with Dodds securing it by a couple of tenths. Dunne didn’t appear in the results due to transponder problems. In Final 2 on a dry track Barnard saw more opposition, mainly from Matthew Rees who led for a couple of laps, with the chasing group including Dodds and Freddie Slater never far away. Dunne made up 26 places to finish 5th behind Barnard, Rees, Slater and Dodds. 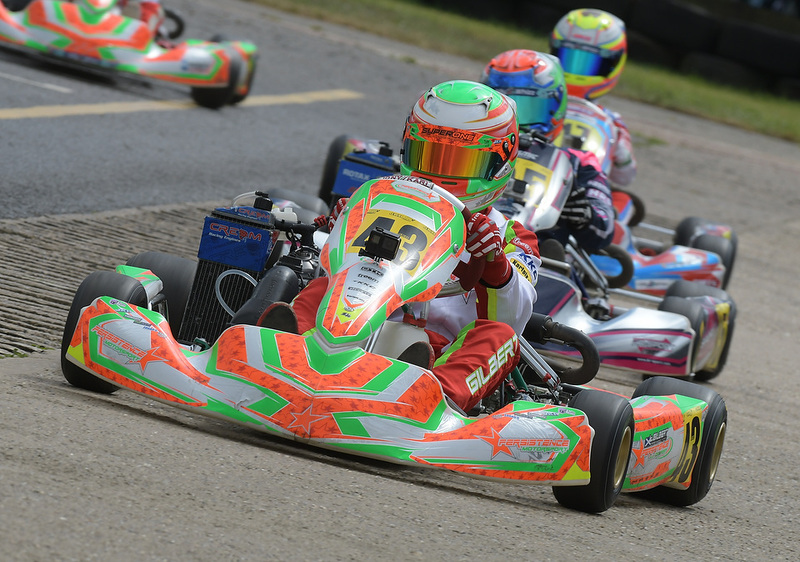 The next round for the IAME Cadets is at Fulbeck on 25th June, where Rees will be attempting to reduce his 44-point deficit to Barnard. 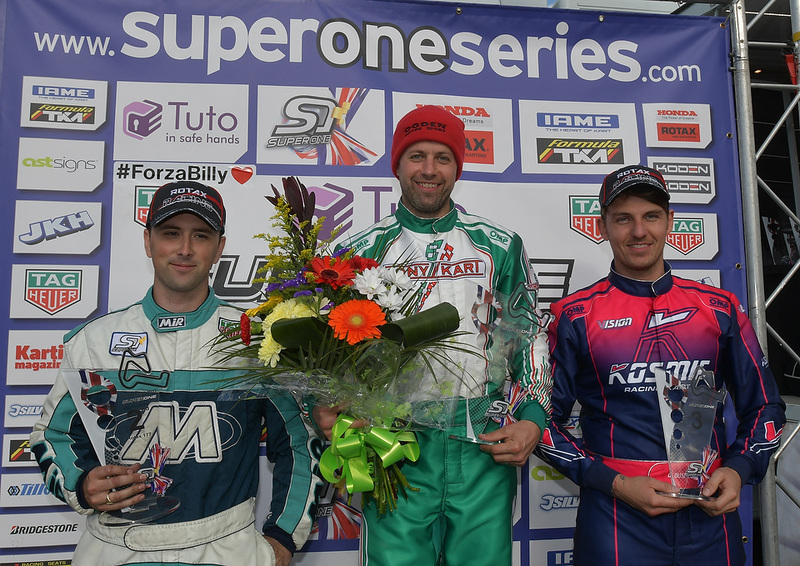 Louie Westover, Reggie Duhy and Dragan Pinsent shared the heat wins while poleman Morgan Porter dropped to 8th. As Final 1 started Westover kept the lead from pole but by the end of lap 1 Pinsent had taken over as part of a battle between himself, Duhy, and eventual winner Luke Whitehead. Pinsent finished 2nd and Porter 3rd while Westover and Duhy had dropped back several seconds. In Final 2 Pinsent, Porter and Whitehead struggled for control with multiple lead changes and Duhy poised in 4th to gain from any mistakes. The race finished in that order, but Whitehead was disqualified for an exhaust problem, promoting Duhy to the podium. Westover leaves Whilton Mill with an 18-point lead over Wilkinson with Duhy another ten points behind that. 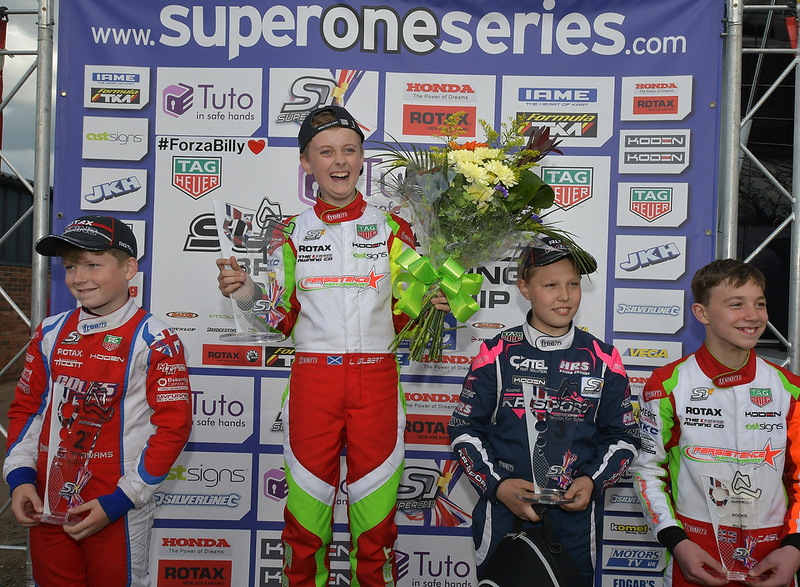 Unlucky so far this season, Oliver Hodgson took two wins in the heats after Qualifying on pole, with Elliot Harvey and Lewis Malin also successful. 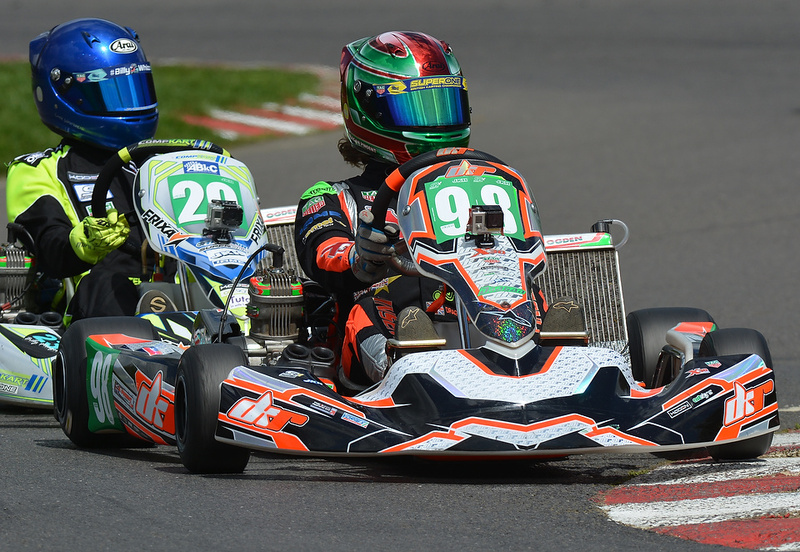 Final 1 was a demonstration of Hodgson and championship leader Danny Keirle’s skill with Joe Turney, new to Senior karting this year, finishing 1.33s behind after gaining places at the start. Hodgson again led the entirety of the race in Final 2, but this time Turney hunted down Keirle to take 2nd halfway through with Keirle a safe distance ahead of Harvey in 4th. 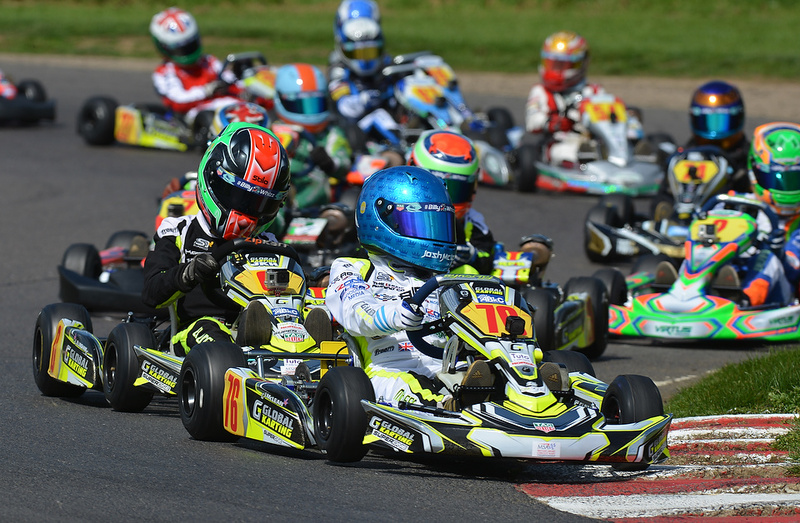 The X30 classes will be out next at Fulbeck on 25th June. Keirle has 578 points to Turner’s 540 while Hodgson is barely in the top ten. 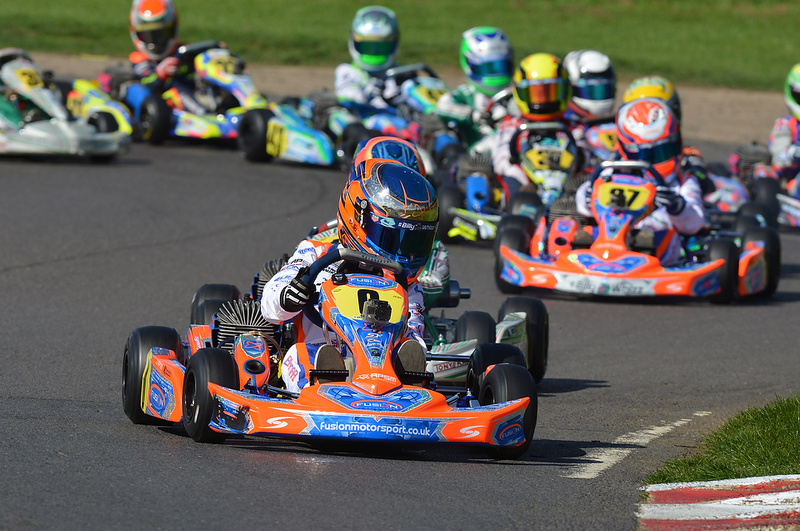 Only four Minimax drivers showed up, and pole went to Tom Adams then the two heat wins to Lewis Gilbert. In Final 1 Lewis Gilbert was the early leader before Adams leapfrogged Kai Hunter to take the lead for the rest of the race. Gilbert retook 2nd in the closing stages. Hunter took the lead at the start in Final 2, then Adams had five laps in the hot seat before Gilbert secured the lead at half distance to win ahead of Adams and Hunter. Bradley Barrett took pole in Qualifying but problems in a heat dropped him down the order while Clayton Ravenscroft took both heat wins. However, Ravenscroft went off at the start of Final 1 leaving Jason Lockwood in the lead who as it turned out had broken formation early at the start and was later penalised 10s. Tyler Chesterton soon took over at the front with Bradley Barrett and Lockwood fighting behind him, but Ben Burgess overtook Lockwood for 3rd two laps from the end. Ravenscroft came back to 7th but was disqualified for non-compliance. Final 2 saw less action at the front with Chesterton leading all the way, gradually pulling away from Tommy Foster and Lewis Gilbert. Barrett’s race had finished almost before it started while Ravenscroft made up 13 places to 10th. 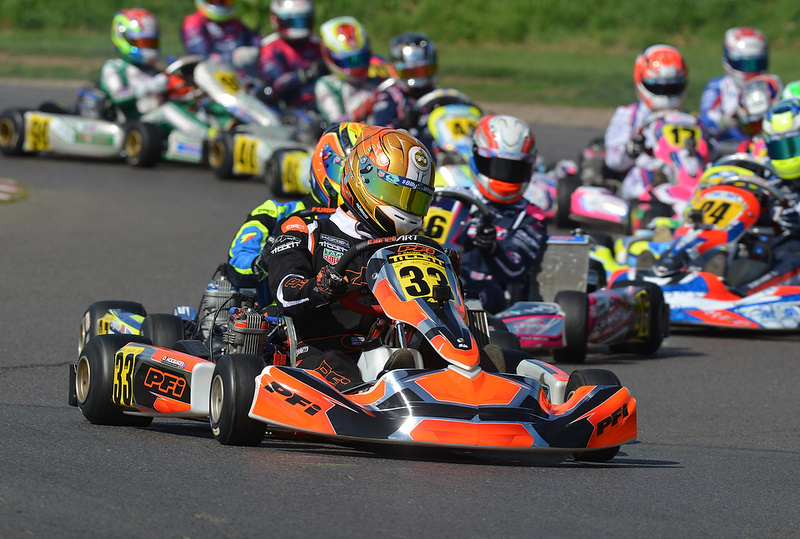 Junior Max will have its next outing at Fulbeck on 25th June where Rhys Hunter will be trying to make up some of his 31-point deficit to Chesterton. Dan Bushell took pole and one of the heat wins, while James Beacroft took the other heat. In Final 1 Bushell took off in the lead for most of the race with Beacroft 2nd until lap 10 when he disappeared, handing 2nd to Tony Dickinson. Dickinson was then able to challenge for the lead and hold it for a couple of laps before the O Plate holder Chris Thomas overtook, after a climb through the field, and pulled away for the remaining three laps to win ahead of Dickinson and Buster Mepham. Thomas led throughout in Final 2 while Beacroft and Bushell worked their way through the field to take 2nd and 3rd ahead of Dickinson. Mepham had crossed the line 2nd but was disqualified for a technical issue. 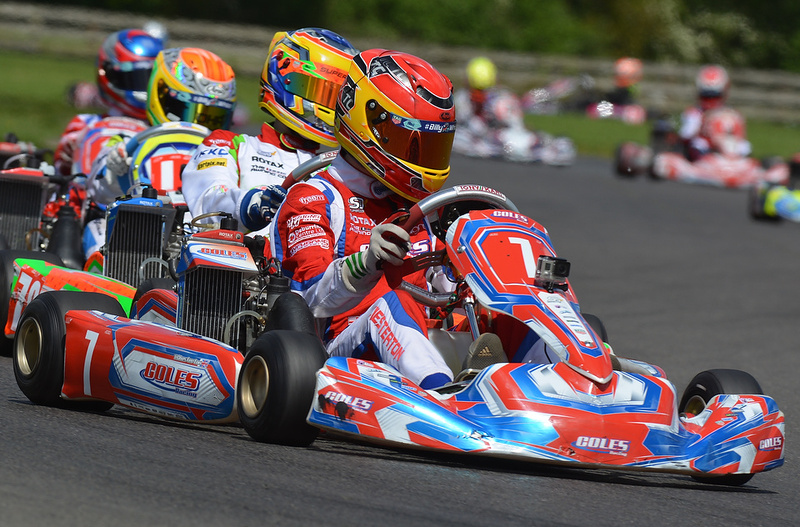 The 177 drivers are on their second round out of three, with a place at the Rotax Max Grand Finals up for grabs for the best. Thomas is now 12 points ahead of Beacroft and 22 points ahead of Dickinson, and the final round will be on 27th August at Shenington.